Didn't think you couldn't enjoy pasta again? Think again! Place noodles in strainer. Drain and rinse very well with hot tap water (2 - 3 minutes). In a large pot, bring water to a boil. Reduce heat to medium-low. Add rinsed noodles. Cover and let simmer 15 minutes. Drain. Place noodles on paper towels and pat dry. Heat a large skillet over medium heat. Add noodles, and "dry fry" for 3-4 minutes, stirring frequently. 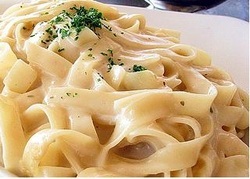 In a small saucepan, warm Alfredo sauce over medium heat. Add meat if desired. Serve over hot noodles.